Planning is an important ingredient for a successful flight. It is always good to think a bit about the "road" ahead: what weather, type of landing places, airspace restrictions, etc., to expect. And about some alternative routes at various points. I'm thinking about this on the day I arrived in Pedro Bernardo, Spain, to participate in the first round of the British Open 2008. So how did I get here ? Well in similar fashion one should plan a bit on where to go flying. What weather and conditions to expect in a particular time of the year, the possibilities to get retrieved, etc. Competitions are good in that usually experienced people have this all sorted out for you. 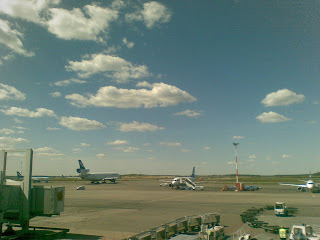 But it just so happened that I left Saturday a picture perfect Helsinki (see picture above) to arrive in rainy Spain. This Sunday was reserved for practice and quite a few people flew a bit before the rains made them hurry for the landing field. 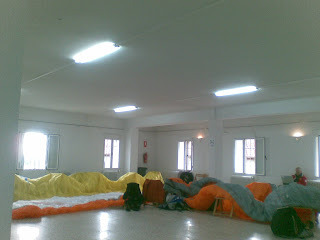 Several gliders are now drying in the competition centre (picture below).